Youth for Christ UP Diliman (YFC-UPD) will once again proclaim that Jesus is alive in the whole UP Diliman campus as their Campus Tour events would once again roll out this coming April 2018. 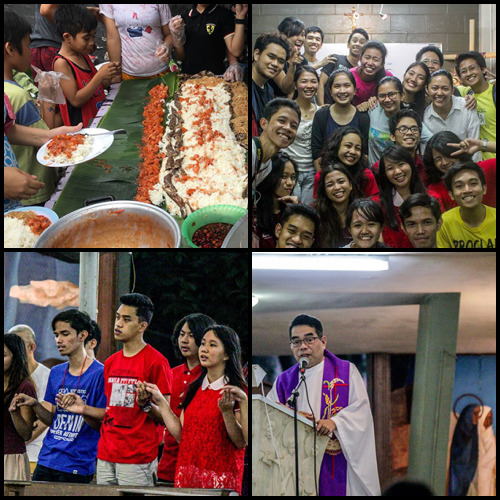 Held annually, YFC-UPD’s Campus Tour events focus on different faith perspectives. 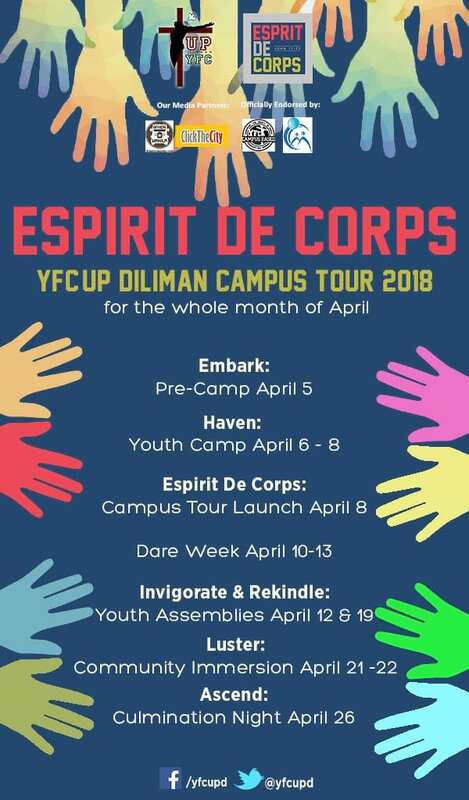 This year, with their theme, Esprit de Corps, a phrase used to describe a feeling of pride, fellowship, and common loyalty shared by the members of a particular group, YFC-UPD will be conducting once again various events that would cater to the whole UP Diliman community, and the nearby public. 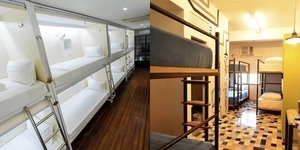 Spearheading the campus tour events this year would be its Youth Camp Haven, a two-night and two-day camp happening this coming April 6-8 2018. The whole camp would impart to its participants the rudiments of a Christian way of living through sessions, talks, fun games, workshops and more. YFC-UPD invites all UP students aged 16-21 who wants to experience fun, faith, friendship, and freedom, the YFC style. Sign-up now at tinyurl.com/yfcupdcamp. Stratagem Dare week, which will be happening from April 10 to 13, 2018, would offer fun mini games for the UP Community. Targeted to be conducted at a street adjacent to Palma Hall (ASCAL), it is an income generating project for YFC-UPD’s community immersion to be held at campus tour’s latter part. Come, see, and play the mini games and win as much as 500 pesos. One will surely have fun for a greater cause in this campus tour event. Two educational youth assemblies would also be conducted in UP Diliman in lieu of Campus Tour 2018. The first of the series is entitled Invigorate, happening on April 12 from 5-8pm. It is an educational forum concerning the mental health issues faced by university or college students. One week after, on April 19, Rekindle Youth Assembly would be conducted from 5-8pm also. Rekindle is another educational forum, this time, about our Christian faith. This event is open for everyone. Lastly, Luster Community Immersion would be held by the organization. Through this event, YFC-UPD members hopes to immerse with the people who experience difficulties in life themselves. 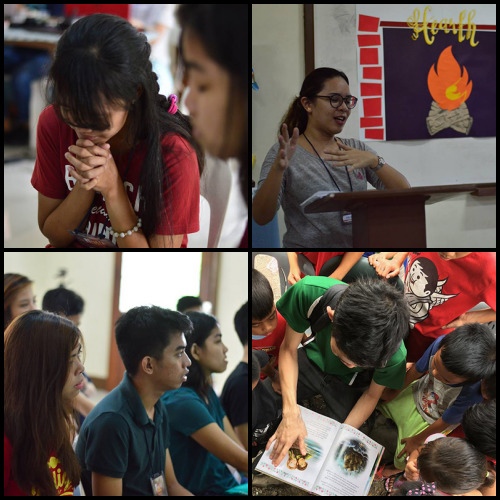 YFC-UPD hopes to spark light and joy in that community by conducting small programs. It would be happening on April 21-22, 2018. YFC-UPD calls for possible organization partners who would be willing to help us in this event, email us at yfc.upd@gmail.com for a possible partnership. Capping-off with Ascend, a YFC-UPD Campus Tour Culmination Night happening on April 26, the organization hopes to celebrate the success of proclaiming Jesus Christ once again in UP Diliman. YFC-UPD will celebrate its triumph in bringing more people closer to the Lord, and in partly answering the mission for the UP Community to find that common fellowship which is our one Faith. Excited for the events? Like us on facebook at fb.com/yfcupd for more campus tour updates. See you there! Youth for Christ UP Diliman is the front-runner in making students in UP Diliman embody the advocacy of being and bringing Christ wherever they are. Answering its call in renewing and uniting the society in Christ through the campuses, it is a CFC-Youth for Christ campus based organization in the premier university which has been established more than 20 years ago. Youth For Christ-UP Diliman, contact us: 09490651409, facebook.com/yfcupd, yfc.upd@gmail.com.